free maya video tutorial, video tutorial for photoshop, 3d reference, website tutorial, css tutoria: Lesson 11 - Learn How to Model Bike Silencer, Shockers, Typre and Rim. 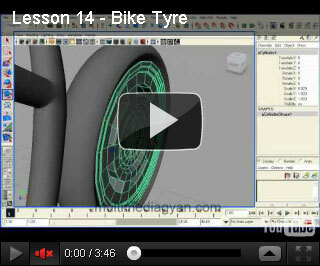 Lesson 11 - Learn How to Model Bike Silencer, Shockers, Typre and Rim. Hello Friends Here some more Video Tutorials on Bike Modeling in Maya. This is my effort to provide tutorial in Hindi which is easy to understand. If you like it Please Comment.